These buckets are the most popular bucket and they are very versatile around the grow room. 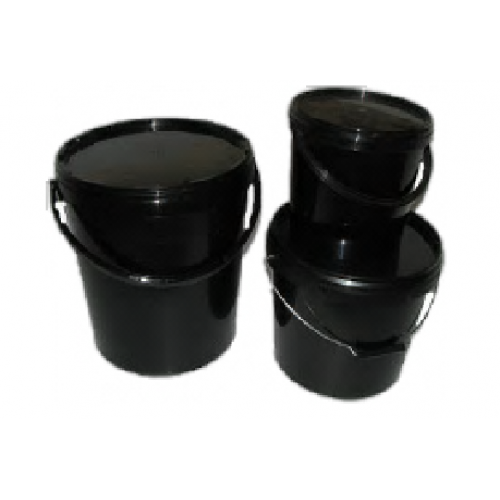 Whether you are mixing nutrients, moving liquids between tap and system, emptying systems of spent solutions or anything else you can think of, the Black Bucket with Lid may be just the ticket! The lid presses down onto the bucket, sealing it to prevent spillages. Another great use for this bucket is to put some Ona gel in it from a 20L pail if you’re trying to divide it into part. Pour some gel in, clip the lid on and drill some holes in it and you’re good to go! Or, leave the lid off if it’s really bad. These bucket are great if you want to make your own bubbler system too. Simply cut a hole in the lid large enough for a net pot to sit in it and install an aeration device in the bottom. It’s as easy as that! With some good root stimulator and hydroponics feed, you’ll be growing in no time!